The Alvey, Ellis, Dorado, Century Cabins have SOLD they are no longer available for rental. Pets are not allowed in any cabins due to pet allergies. Cabins are rented out monthly. Nautical Cabin: Wow! Look at that view overlooking the lake from your own private deck. The Nautical Cabin’s interior design is among the best. It contains one heavenly queen size pillow top bed with Egyptian cotton sheets. Full kitchen with all you will need, (this unit does not come with a stove, it has a double hot plate and a toaster oven. Full bathroom shower only (no tub). The Nautical Cabin also features a 32 inch flat screen television with Direct TV. Other amenities include a wooden patio table with 4 chairs. Daily rate $99 Mon-Thur $119. Fri.& Sat. The Nautical Cabin is available to be purchased for $23,900. The Weston Cabin is completely furnished down to the Egyptian cotton sheets to provide a heavenly nights rest. French doors lead into the bedroom complete with a queen size bed. Bath towels are provided in the full size bathroom with shower. The Weston Cabin also includes Central AC/Heat and also a pristine living & dining area. The kitchen includes a refrigerator, stove, microwave, coffee maker, cooking kettles and dishes. The Weston Cabin features a Flat screen television with Direct TV and free Wi Fi. This cabin sleeps 2 adults and 2 children (pull out in the living-room). The Weston Cabin is available to be purchased for $48,900. The Madison Cabin is a lovely 2 bedroom, 1 bath, fully furnished cabin/home that was moved to Lake Falling Star in 2012 and fully restored using eco friendly and reclaimed materials. The Madison Cabin is tastefully decorated. 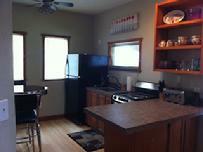 The kitchen is furnished with a refrigerator, stove/oven, dishwasher, coffee maker, toaster and microwave. The Madison Cabin sleeps up to 6 people. Enjoy your morning coffee, or the view of the setting sun, from your own covered deck. The first bedroom has a queen pillowtop bed with Egyptian cotton sheets. The 2nd bedroom has a full size log bed with a large walkin closet. The Madison Cabin features Central A/C, restored wooden flooring, a sleeper sofa in the living room and a Television with Direct TV. Daily and Weekly stays (linen and towels are provided), monthly stays (guest is responsible for their linens and towels). Daily rate $179 Mon-Thur $199 Fri. & Sat. This cabin can be purchased for $62,000. The Meadow Cabin ia a 1 bedroom, 1 bathroom boutique cabin and is the newest edition at Lake Falling Star. It is a custom designed cabin built in 2012 by Walter Stephens using eco friendly and reclaimed materials. Set back among the trees, it's covered deck overlooks the meadow and our picturesque Tinney Lake. The Meadow Cabin has custom drapes, a large television with Direct TV And is fully furnished throughout. The kitchen has table settings for 2, all cooking utinsels are provided, refrigerater, stove/oven, microwave, toaster, coffee maker. Enjoy a heavenly nights sleep on your queen bed complete with down comforter, and Egyptian cotton sheets. Also available is a bathroom with shower and towels that are provided. The Meadow is not a pet friendly cabin. Daily and Weekly stays (linens and towels are provided), Monthly or longer stays (guests are responsible for their linens and towels). Daily rate $109 Mon-Thur. $119 Fri. & Sat. This cabin/tiny home can be purchased for $41,900. All of our Cabins require a $200 security deposit at time of reservation and will be refunded at time of post inspection. Also, a deposit equal to the number of nights reserved will be charged at the time the reservation. *Cancellations made less than 30 days prior to arrival will forfeit the deposit amount. There is a $50 processing fee for cancellations. If you get lost, please call (512)398-STAR.